Where: Uno Village, Ta Qali, Malta. The festival site is located in the Ta Qali area, one of the most beautiful parts of the island (a short 20 minute bus transfer from where the boat and beach parties take place). Situated in the middle of the Mediterranean sea, the sun kissed island of Malta enjoys over 300 days of sun a year, clear blue waters, stunning beaches and easy going island life – making it the perfect festival holiday destination. Aside from enjoying a holiday soundtrack provided by an ever evolving line-up of global musicians, beach and boat parties, festival-goers can also spend time snorkeling, diving or taking a trip around the islands, to sample the local cuisine or visit one of the nearby incredible beaches such as Gozo or Comino. An amazing nature site, the Blue Lagoon is a mesmerizing scene of crystal-clear turquoise waters. It has a South Pacific quality with the waters lapping over a white-sand seabed. Mellieha Bay is Malta’s largest beach and is located in the North of the main island, on the outskirts of the village of Mellieha. The beach is also known as Ghadira (pron. a-deerah) Bay roughly 800m long and was awarded Blue Flag status! Paradise Bay is the best beach on Malta’s northern hammerhead peninsula (close to the Gozo ferry) is Paradise Bay. This golden-sand beach has a thatched café beside clear blue water. You can lie in the sun here looking across the sea to Malta’s little sister islands of Comino and Gozo. Sun, hot weather and some of the best beaches you’ve ever seen. 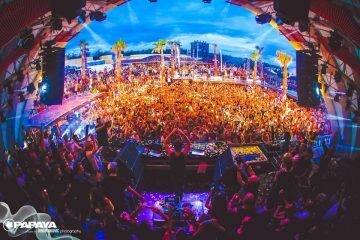 3 open air stages – Pool and Beach Parties and a huge line up. This is what to expect from our first ever Summer Festival – 3 days of Island fun, summer vibes and outstanding locations. 300 Days of sun – warm weather, stunning beaches, breathtaking scenery and easy-going island life. Malta is your perfect holiday festival destination this summer! The Topaz Hotel is a 326 room non-smoking 3 star hotel in Malta as classified by the Malta Tourism Authority that first opened its doors to customers in 1987. Situated in a quiet part of St. Paul’s Bay, 700 metres from Bugibba’s main square and 800 meters from Bugibba’s seafront promenade and its rocky beach. The Malta National Aquarium, the Empire Cinemas as well as the Bird Park are also in the vicinity of the hotel. The accommodation is split over 5 floors in three buildings (with an underpass linking two of the buildings). The hotel has six lifts and offers rooms with balconies with internal residential street views or views of the outdoor pool (subject to a paid upgrade) as well as rooms without a balcony. All rooms include a bath or shower and the use of a fridge, a safe and a kettle. A flat screen TV with various channels completes the room amenities. The rooms are air-conditioned and heated (times may apply). Rooms may be checked in from 14:00 and all rooms have to be checked out by 11:00. The hotel operates a 24/7 reception desk as well as a pub (closed in the summer months) and a restaurant serving buffet meals as well as a pizzeria (serving pizza and pasta from 18:00), a hairdresser, a massage parlour, a souvenir shop, hospitality desks, vending machines with hot and cold drinks, free throttled wifi spots in the lower lobby, in the lounge and library and in the mid-way lounge of the west building. The hotel provides wireless internet (WiFi) to other parts of the hotel as well as in rooms at a charge, using pre-paid cards that may be purchased at the reception desk. The hotel has a multi-use area, 1 small conference room and a large hall, The Forum. Beach and Boat parties during the day, 3 outdoor stages during the night. From sunrise to sunset music at its finest! Boat and Beach parties announcing soon! 1) What is included in my festival ticket? Your festival ticket includes 3 days of partying at the festival site. You will have access to over 60 DJs and 3 open air stages across the 3 days. For those who want to experience everything TheSoundYouNeed Malta has to offer, we’ll be offering boat parties in addition to the main festival. The boat parties will take place during the day across the Friday, Saturday and Sunday. They will set sail from the St Paul – Bugibba area. Please arrive 60 minutes before your boat sets sail from port. 3) What are the festival timings? The main festival will start at 4pm and finish at 4am from Friday till Sunday. 4) Is this a camping festival? The TheSoundYouNeed Malta is not a camping festival and you will need to book accommodation for the duration of your stay. 5) Will I be able to leave and enter the festival at will? Yes, you will be free to come and go from the festival grounds as you please. 6) What happens if my wristband breaks? Wristbands will only be issued once and broken / lost wristbands will not be replaced. 1) How much are the tickets for? GA tickets are for £151 and VIP tickets are for £227, booking fee included for both. VIP tickets gives you access to the VIP area, VIP bar and fast track entrance. For this package, a GA ticket is added with your accommodation per person. 2) What kind of tickets is it? All festival tickets are e-tickets. 3) When will I receive my ticket? As the tickets are e-tickets you will receive them once you have purchased and filled in contact details for each ticket. You will receive the ticket by email in PDF format. 4) What happens if I lose my ticket? If you lose your ticket, please log into your account and proceed to “My Orders” and select your ticket. From here you can print off the ticket as a PDF. 5) What is the age restriction of the festival? 6) Is ID required to enter the festival? Yes, valid photo ID is required upon entry to the festival grounds. 7) What is required to enter the festival? Valid photo ID and your ticket, with the barcode. If you are booking through our travel portal then the hotel is situated in the St. Pauls area. 2) Where is the best place to stay for the festival? St Pauls / Bugibba area is the ideal area to stay in, as the festival shuttle bus departs from here. 3) I want to be situated near the beach parties, where should I stay? The beach parties will take place in and around St Paul / Bugibba area. 1) What flights connect to Malta? All major UK airports connect direct to Malta. There are over 20 direct flights to Malta each day and many more indirect flights via mainland Europe. 2) Which airport should I fly to? The island of Malta only has one airport, aptly named Malta International Airport. 1) What is the average temperature in Malta? 2) What is the local currency? The local currency is Euro’s. There are cash machines and some Bureau De Exchanges located both at the hotels and around Malta. 3) What is the local language? The local languages are English and Maltese. 4) What is the time difference? The local time in Malta is GMT+1. From 1st June, 2016, 0.50 EUR will be charge as an Environmental Contribution by the Government and is payable during check-in at the hotel. Free cancellation if cancelled 14 days before the arrival date. If cancelled anything from 14 to 7 days before the arrival date then 50% will be deducted. If cancelled 7 days or less before the arrival date then 100% will be charged.